It looks like my comic book guy’s troubles with UPS and Diamond are finally straightened out. Everything that should have been out this week was on the shelves and in pull boxes…as were books from two and three weeks ago finally. I feel pretty good about saying that the Game Tape season is back in full and proper swing. This week is going to be more of a catch-all for the last several weeks; I’m too lazy to look and see when things shipped, and if it’s really good you should know about it and make it part of your collection. Standard caveats apply: Jeff Parker is to comics as Five Guys is to fast food, and no one understands all things Muppet related better than Roger Langridge. That said, let’s look at the game tape, shall we? I’m still on the fence about this volume of The Avengers. #5 is less jumpy than past issues and there’s only a smattering of Bendis’ trademark snippy and snappy dialogue. It finally felt like something was happening, and it seems we’re on the down hill side of the arc. It’s still a time travel story and now they’ve thrown in Ultron which goes a long way for me. Disappointingly though, they stole Rip Hunter and the Distinguished Competition’s wall-of-scribbled-hints-of-the-future-schtick. I’ll see it through to the end of this arc, but I can’t see sticking around for Bendis’ slow and long-form storytelling. On the other hand, Brubaker’s long-form stories feel like we’re accomplishing something in each issue or two. Secret Avengers #5 is crafted so well that I found myself enjoying what is nothing more than a Life Model Decoy story. It’s not the best issue of the run so far, but kudos to Brubaker for taking a story that’s been told so many times before into something breezy and enjoyable. Also of note (more so since I don’t often notice it) is the layout of the book. Smaller panels and varied page-layouts help this story flow and feel tense in a Jason Bourne sense. David Aja and co. are doing a fantastic job with the art chores on this book. What’s a Decepticon with no leader and no clear enemy to do? How about fight for a faction of humans willing to pay in Energon? The Combaticons (minus Swindle) have joined with North Korea and it’s up to the US’s own Autobots to keep ’em in check. It’s an interesting idea: tying these giant robots to our own nationalistic tendencies. There are some outstanding character moments (Brawn and Bluestreak/ Silverstreak) great character moments here (Thundercracker and Bumblebee), and a chilling and off kilter character moment (Ratchet). I chuckled appreciatively at the last page too. Not much action, but it’s quality over quantity. The Muppet retellings have been hit or miss with me. Muppet Robin Hood was pretty rough, but the lovely Grace Randolph’s Muppet Peter Pan was spot on. In this fifth shot at a retelling looks to fall in the win column. 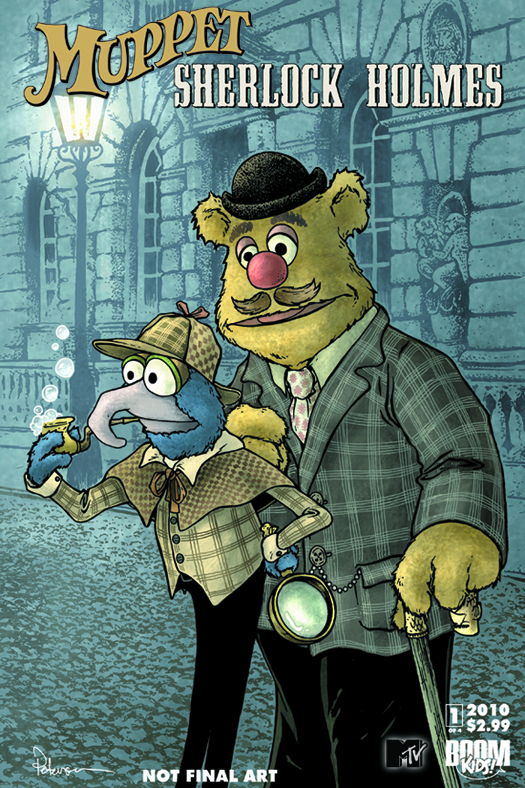 Patrick Storck’s Muppet Sherlock Holmes presents us with a quirky and strong Muppet version of “The Speckled Band.” The easy choice would have been to pair Gonzo and Rizzo or Kermit and Fozzie in the roles of the Baker Street duo. The inspired choice was to pair a Sherlockian Gonzo with Fozzie’s Dr. Watson. Their brand of Marxist (the brothers, not Karl) chaos makes for a rare gem. Amy Mebberson is on art chores here. Previously I spoke against her Fozzie. The problems are gone; the balance is back in the face. The inclusion of art by Amy Mebberson, her keen eye for detail and little sight gags, and a nice Veterinarian’s Hospital page turn the gem into a diadem. This one’s worth picking up in singles or trade. There were also three GI Joe books waiting for me. Two were good, the other sort of adequate. GI Joe: Cobra II continues to delve into the darker, but more practical corners the secret organization. This month it looks at the training of Range Vipers. It’s good and sinister, and it draws heavily from the toy’s file card. GI Joe (on-going) is quickly building to a head on collision between the Joes and Cobra. The Commander is on the board now in a serious way and it’s only taken 25 issues. GI Joe: Origins #19 was an homage to Hama’s other silent issue. It’s for those that care about how Snake Eyes and Timber first crossed paths. I am not one of those people who care. It took me a long time to realize that the notes Wolverine signed as "F.U." meant Felix Unger. He too thinks of us as "The Odd Couple." The pouches were Hank's idea. Said they were more manly than the European carry-all I bought in Alaska. I was invited to join the Avengers once. Thought about it; didn't. That there's a total sausage fest. You know who's a real wet blanket? Quicksilver. Guy's always going on about his old man. Screw it dude; it's beer-thirty.